Remember Aung San Suu Kyi? She was a Nobel Peace Prize winner. Those were the days when she was an oppressed citizen of Burma. Today she is a lawmaker, the leader of the opposition in Burma. Yet the country has been witness to a systematic genocide of the Rohingya by its ruling elite and she has remained silent, totally silent, opting to cling on to her newfound power rather than speak out for the oppressed. Suu Kyi represents a brand of politicians who are abundant in supply, their demand stemming from their flexibility in compromising the most basic of their beliefs for the sake of that Holy Grail called power. 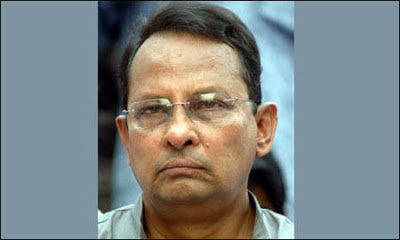 One such person is Hasanul Haq Inu, Minister of Information; Government of the People’s Republic of Bangladesh. Son of Late AHM Qamrul Haq, who retired as General Manager of Karnaphuli Paper Mills, Inu comes across as the typical silver spooned toddler. Before I delve further, it is of importance that we keep in mind that Inu did not have ideals to start with. His history bears witness. Inu, on his profile on the ministry of information website, gives us censored bits and pieces of his life. He started with the Chatra League in 1968. To step up towatds a more intense role, he joined the rage of the time, ‘Shwadin Bangla Biplobi Parishad’ (Bangladesh Liberation Front) in 1969. It is mentionable that Swadhin Bangla Biplobi Parishad, was secretly organised for the independence of Bangladesh in 1962. Later it formed a political wing, Bangladesh Liberation Force (BLF), which was renamed ‘Mujib Bahini’ during the 9-month Liberation War. His role in the Liberation war seems to be warped up. After a series of armed marches (as claimed by his website), he suddenly gets relocated to India, playing a very 'major role' in the Liberation War (as an instructor at a camp in India). It is clear however, that the man did not fight or kill one Pak soldier in the entire course of the war. His war tales subside to take him to join the opposition left party Jatiyo Samajtantrik Dal (JASOD), apparently in a fallout with the ruling Awami League just five months after Bangabandhu 'entrusted' him with a job to create a new party (Jatiyo Krishak League). How important he was at the time, we do not really know. Trumping up his version of events, he places himself as the founder of the Gono Bahini after the banning of all political parties in 1974 by founding father of Bangladesh, Sheikh Mujibur Rahman(the emergence of the BAKSAL). The Gono Bahini (People's Army) started as a 'noble' endeavor to resist the BAKSHAL. In reality, it was party to an ugly chapter in Bangladeshi politics. An offshoot of the JASOD, it is rarely talked about nowadays due to obvious reasons I shall talk about later. Here is a description I find quite informative, "Jatiya Samajtantrik Dal, formidable enemy of the Awami League, was getting enough clout in educational institutions across the nation. In the village level its underground fronts, namely, Gono Bahini and Bangladesher Communist League were gathering experience in killing Awami Leaguers and confronting Rakkhi Bahini. Although JSD was proponent of “Scientific socialism”whatever it means, it was not thrilled to see a left wing metamorphosis of Awami League. This party was ready to push the country to a bloody civil war with the clear ambition of eliminating Awami League from the political power." A BAKSAL supportive blog has this to say about the Gono Bahini, "Most of the cadres of the Islamic parties went underground. At the same time, the Maoists/communists formed underground political parties with armed cadres to carry on armed revolution inside our motherland. In the aftermath of the independence of Bangladesh, all these underground extremists created a terrible condition in the newly born republic. Even the ultra-leftists formed political parties and their armed wings (such as Gonobahini) to implement “scientific socialism,” a term not quite clear even to the proponents." The Gono Bahini was led by Colonel Taher and his deputy was Hasanul Haque Inu. The feud between theRakhi Bahini (paramilitary force sanctioned by the state) and the Gono Bahini along with a group of other armed groups led to thousands of deaths. I shall not go into details, but what I intend to say is that the Gono Bahini was not an angel as Inu claims it to be. A recent article by Sangram details how Gono Bahini was involved in acts of massacre of civilians and terrorist acts against the state. The same article refers to an article by Amader Shomoy (5 November, 2009) which details how Col. Taher (tugging behind him Inu), planned to ultimately kill Bangabandhu Sheikh Mujib and perform a coup; only they were beaten to it by a group of military officers. The duo had contact with the army officers, met army officers at the Betar Bhobon after the coup, and even met President Khandakar Moshtaq (president immediately after the coup) at the Bangabhaban for at least 3 days in order to influence the chain of events. Inu, of course was complicit in all of this. Inu, after his new job as Minister at the Ministry of Information, his first chance at a real government post, has shown his true colours. The latest in this facade of upholding freedom and ideals of democracy in Bangladesh are his scathing comments against editors of the country’s 15 daily newspapers, who on Saturday demandedthe government allow the recently closed private television channels Diganta TV and Islamic Television to go on air again and the release of Amardesh acting editor Mahmudur Rahman. In a scathing attack, he said such appeal was ‘not in the best interest of the media’. An Islamophobic atheist all his life, it was rather heart warming indeed to hear him spewing farcical statements saying that Mahmudur Rahman had not been arrested for hgis writings against Hasina or the state, but for his 'hurting religious sentiments' and 'hacking' of the ICT conversations. A Daily Star editorial was cuttingly indignant in its reply, saying that "It appears that 15 editors of, almost all leading papers of the country, collectively do not know “facts” which only the information minister knows." The facts it raised stroked the problems to their core. I can only do justice by reposting it here. "The fact Mr. Minister is that Amar Desh is closed without being banned. The fact is that Mahmudur Rahman, editor of Amar Desh, has been in jail for the last one month with dozens of charges against him with none having been proved in the court law. The fact is that he has been taken on several days’ remand during which, his family has alleged, that he was tortured.Do you remember Mr. Minister the days when it was customary to assume someone innocent before proven guilty in court? The fact the honourable minister is that Amar Desh printing press is under lock and key on the excuse that the premise in being investigated. How long does it take to do so? Well it can take a few hours or few years as the government wants and we know what it wishes. The fact is that the government is yet to give reasons why the two TV channels are being kept closed?These are the facts protesting which the 15 editors have given a statement." A New Age editorial was more pragmatic in its approach when it put forward this simple observation in refuting the comments of Inu when its said that his comments were "a reconfirmation of the incumbents’ increasing intolerance with divergent opinion — be it in the political arena or in society at large." On the issues at hand, the editorial scathingly retorted, "Indeed, the Amar Desh acting editor is guilty of his paper’s publication of a misleading photograph; however, he did subsequently apologise for the mistake. No one should presume that a journalist or a media outlet is infallible because they are not. What deserves recognition and even appreciation is when a journalist or a media outlet regrets the mistake and apologise, both of which Amar Desh and its acting editor did. As for the closure of Diganta TV and Islamic TV, the government has clearly acted arbitrarily and now seems to be at pains to justify its actions. It is worth noting that these two television channels broadcast live the predawn joint operation by the police, the Rapid Action Battalion and the paramilitary Border Guard Bangladesh at Motijheel on May 6, just as many other electronic media outlets did. However, these other television channels managed to evade the government’s wrath, apparently because of their close links with the ruling Awami League." A few words were enough to decimate the government's attitude towards the media, "Regrettably, such highhandedness is neither isolated nor unprecedented but has, in fact, characterised the tenure of the AL-led government since its assumption of office in January 2009." Trust New Age to give a fitting one. "Hence, rights-conscious and democratically-oriented sections of society need to raise their voice in unison against the abuse of people’s mandate to govern the country by the incumbents." He is the Goebbels of Bangladesh.